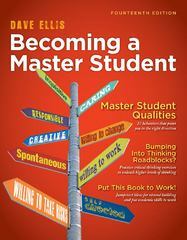 Becoming a Master Student 15 Edition BECOMING A MASTER STUDENT Fifteenth Edition is all about "Embracing the new". As students begin their education, they embrace a new culture and need new tools to be successful. BECOMING A MASTER STUDENT can be their guide! Beginning with a new Power Process motivational article called "Embracing the new" students will be empowered to try new tools presented in the textbook to enhance their experience in college and in life. Tools like the Discovery Wheel and Discovery and Intention Journal System to Power Process articles, Master Student Profiles, and the Kolb Learning Style Inventory (LSI), have made BECOMING A MASTER STUDENT the bestselling College Success textbook and will give students a deeper knowledge of themselves and their power to be successful in college. Integrated technology discussions and tips throughout the chapters help today's students navigate the wide variety of web resources and apps that can support them throughout college. And, with the Fifteenth Edition, Cengage's MindTap Course will bring all of these assets to one place with an integrated technology solution.